"You guys, this is exactly how I pictured my death!" "Physics is the study of the movement of, uh, bodies in space and it can unlock the mysteries of the universe but it cannot answer the essential question of what is our purpose here and to me the purpose of life is to love and to love is what you have shown me. I didn't think that I would ever really have a friend until I met Abby and then I feel like I have a family of my own and I love you, thank you." Holtzmann is just the best. Mainly because she's played by Kate McKinnon, who is even more the best. She's the best on SNL, she's the best in Ghostbusters and she's the best in real life. 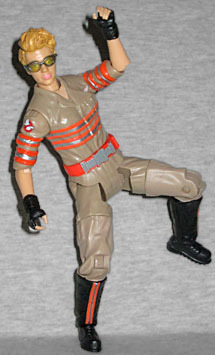 The figure is easily recognizable, thanks to its crazy Egon pompadour and its yellow goggles, but the important fact is we now have a Kate McKinnon action figure! Woo! You'll want to look at the paint if you can before you buy: her eyes get wonky. In two reviews so far, we've talked about the fact that Mattel is giving these women unique body sculpts, when that was apparently too much to ask for the male figures. Turns out that wasn't entirely accurate, because Holtzmann is partially the same as Erin. You can tell that this was a digital sculpt, because while the two figures wear their collars fastened to different levels, the pattern of wrinkles between their belts and their safety stripes are identical. Holtzmann's legs are larger than Erin's, but they have the same folds in the cloth. So basically, someone took a computer file and squashed and stretched it to make it just different enough that it required different tooling. It's also possible what we told you about the articulation has been wrong, too. Neither Abby nor Erin seemed to have balljointed necks, like the male figures did, but Holtzmann does. 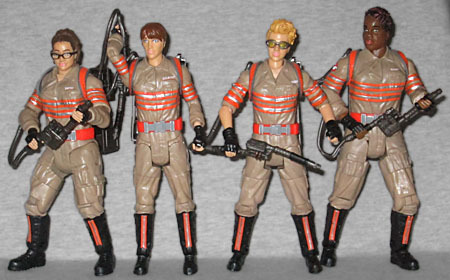 Did the other two have them, and they were just designed so badly that they didn't function correctly, or did Mattel choose to give Jillian Holtzmann superior articulation for no clear reason? Whatever the case, she still only has swivel wrists, no hinges. Other than that, she moves at the ankles, knees, thighs, hips, waist, elbows and shoulders, which is about all you can expect from Mattel, the toy industry's C-students. Considering the way she's always dancing around or lounging in weird positions, being able to move is important. 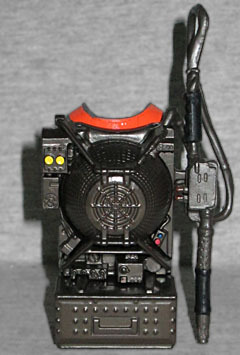 All the Ghostbusters come with the same (removable) proton pack, which is generally fine (a very nice sculpt that's completely accurate to the film, but is almost entirely unpainted and so looks cheap and toyish) but feels lacking in Holtzman's case. These figures are based on the end of the movie, yes? So where's the bandolier of proton grenades? Where are the pop-out proton pistols she used in one of the most badass scenes in the entire franchise? Give us guns, Mattel - we can never get enough of Kate McKinnon licking things. Yeah, Holtzmann, lick it good! 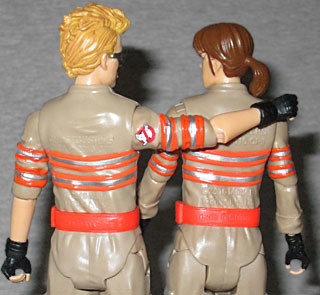 The Ghostbusters figures each come with a Build-A-Figure piece (which Mattel is still calling "Collect and Connect," because they paid someone in marketing a lot of money to come up with that awful name, and by gum they're going to use it). The BAF is Rowan, and Holtzmann has his entire marshmallowy body. Kate McKinnon is hands-down awesome, no question about that. And her character in Ghostbusters is just as awesome. Heck, even the people who were dedicated to hating the movie no matter what had to admit that Holtzmann was a winning part of the equation. Of the four figures in this series, Holtzmann is the hardest to find, suggesting that either A) Mattel heavy-packed the two straight white ladies to the detriment of the other half of the team, or 2) everybody wants a tiny plastic Kate McKinnon to call their own.